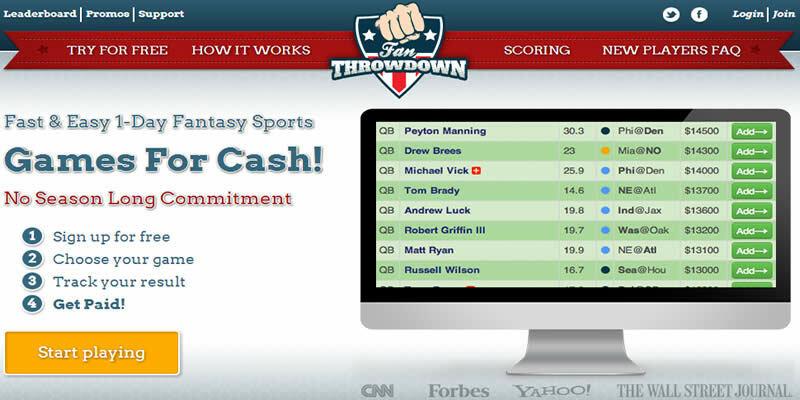 Fan Throwdown made a big splash in the fantasy sports industry by buying out first BuzzDraft and then Daily Joust. Having been acquired by MGT Capital Investments in Aril 2013, FanThrowdown has the financial backing to become a major player in the daily fantasy sports industry long term. Having a big financial company behind them, means players can rest assured that their deposits are in safe hands. Overall, if you are a fan of different games, then signing up to Fan Throwdown is a no-brainer. Throw in the fact that they offer PGA Fantasy Golf and are in the works for including Fantasy NASCAR, it is easy to see why FanThrowdown is one of the top daily fantasy sites out there. 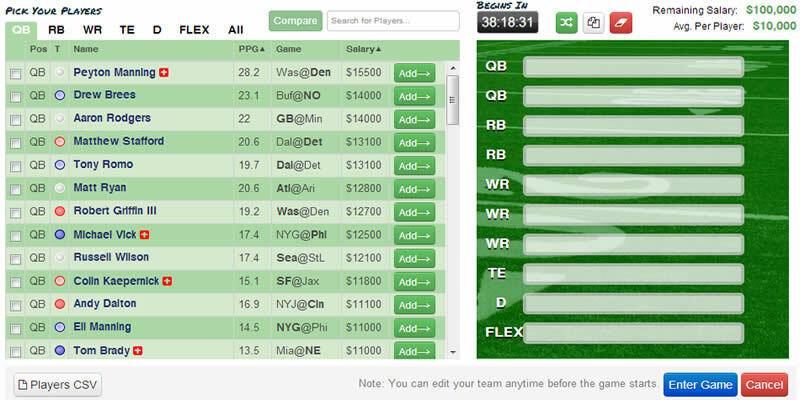 Salary Cap – Choose a team of players and fill a roster using a salary cap of $100,000. Pick 5 – Choose the higher point getter between two players for five rounds. If you successfully pick 3 out of 5, you win. Over/Under – More details to come. Bracket – Do you play in March Madness bracket pools? Then you know how to play FanThrowdown’s bracket contests. Face an opponent, and if you win, you’re off to the next round…lose and you're out! The lobby of Fan Throwdown is nicely laid out. Filters on the left side help you narrow choices by leagues, types of games, size of league, your desired buy-in and the type of payout you are looking for. The main section adjusts based on your filter choices and narrows for easy access to what games are available. The top of the page has a nice summary of the balance in your account, if you have any pending game tickets as well as another drop down menu header that allows you access to support tabs such as “How it Works”, “Scoring and Rules” and of course “Support”. There is a live chat box that is often looked after by a member of the FanThrowdown support team so you can ask questions and get quick answers if you are in a pinch. If the chat box bothers you, it can be closed off as well. Gameplay at FanThrowdown.com is easy with live scoring being quick and responsive. Choosing players for fantasy teams is challenging, but fair - you can create a competitive lineup without having to scrape the bottom of the fantasy barrel. One nice factor is when clicking on a player, the amount of info provided is good for novice players. The interface itself is quick and responsive, but be warned if your browser is out of date, the FanThrowdown page occasionally is slow to load - but often that is the user's fault…the solution is to update your internet browser. 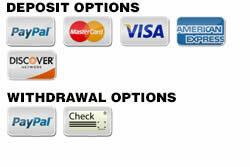 Deposits can be made easily through PayPal or various credit cards (such as Mastercard, Visa, American Express and Discover. Upon deposit, players normally receive a 100% deposit bonus up to $200...however Real Money Fantasy Leagues has negotiated a $300 bonus for our visitors. Use THIS LINK to claim your extra bonus or any of the links on this Fan Throwdown Review page. You can cash out through PayPal in under 48 hours and if you request payment by check it will also be mailed out within that 48 hour time frame. FanThrowdown has a great customer support system - You can call them 24/7, you can create a support ticket, or best of all, you can do a live chat with someone from Fan Throwdown. There is a representative available from about 8am EST to 12am EST and they are quick to answer questions and look into issues. We decided to test things out by enquiring as to when the PGA games would be posted using the chat window. A FanThrowdown member got back to us within 5 minutes stating that he’d look into it and then about 15 minutes later, he answered my question. Fan Throwdown has an easy to use mobile platform that once you login helps steer you to that games you want to play. Even just on a small smartphone screen such as an iPhone, fantasy players can easily navigate through the FanThrowdown.com mobile site. Fan Throwdown’s mobile site is supported on Apple devices such as iPhone, iPad and iPad Air as well as all Android platforms. To create our FanThrowdown review, we tested the site for many games and for the most part liked what we experienced. Playing at Fan Throwdown is a visually pleasing experience. The look of the site is very nice and the choices of game offerings as well as the types of sports offered makes having an account at FanThrowdown.com a must. Salary Cap game prices are fair and allow a player to build a competitive lineup. Having other games such as the Pick Five, Over/Under and Bracket games available occasionally gives you a nice change of pace. If you are a new player looking to try out daily fantasy sports at FanThrowdown.com, or just want to check out the site without investing too much into it, the lack of free games is a bit of a deterrent. 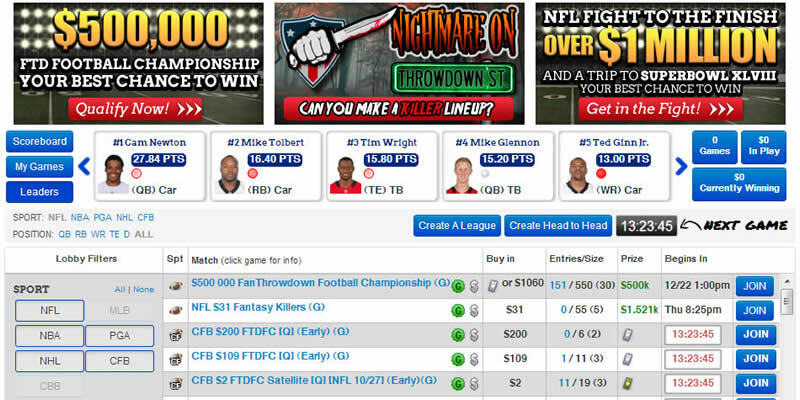 If you’re a big time daily fantasy player, FanThrowdown’s lack of HUGE promotions can be discouraging.